Since it arrived last year, the Galaxy S III has been the world's best-selling smartphone that wasn't born in Cupertino. An impressive feat, but one that—along with Samsung's Megatron-sized hype-machine—has made for sky-high expectations for the sequel. Our first impressions of the S4 left us a little cold, but we've now spent a full week getting to know it better. It's definitely one of the best phones you can buy. It's just shame it couldn't stay out of its own way. Samsung's next great hope of a superphone. It's got a 5-inch 1080p Super AMOLED screen, a superfast quad-core 1.9GHz Snapdragon 600 processor, 2GB RAM, LTE, NFC, and a 13MP camera. It also has a beefy 2600mAh battery, and an IR blaster for controlling your home entertainment system. It comes running Android 4.2.2 with Samsung's heavy TouchWiz skin on top of it. It should be available on every major U.S. wireless carrier in the next few weeks. If you're familiar with the Galaxy S III, the S4 will look strikingly familiar. It retains the same rounded-rectangle look, with metal edges and a slippery, finger-print-trapping plastic back that looks like it belongs on a far more downmarket phone. It's at least functional, though; the back is removable, so you can swap out the battery or expand your storage capabilities with a micro SD card. A lot of people prefer that added utility over the more solid-feeling, and more beautiful unibody design of, say, the HTC One. One place Samsung does manage to score design points is growing the screen from 4.8 inches on the Galaxy S III to a full 5.0 inches on the S4, while still making the phone thinner, narrower, and easier to grip. The side bezels are shrunk down to nearly nothing, and the screen takes up almost the entire front of the device. Speaking of the screen, it is easily the nicest Samsung has ever made. The colors (especially blues and greens) really pop, and the 441 pixels per inch ensure that text is super-clear. It's also bright enough to be clearly readable on a bright, sunny day, and the Super AMOLED screen makes the blacks like staring into the abyss. That being said, we still slightly prefer the screen on the HTC One. There's something about it that looks matte, like a magazine, and colors are more accurate. While Nexus phones are moving away from physical buttons for navigation, Samsung has opted to include three of them here. The S4 has capacitive buttons for Menu and Back, and a physical, clickable button for Home. It's wasted space. But worse, the capacitive buttons don't light up until you actually touch them, so if you forget which side is Menu and which is Back you might end up closing out of something unintentionally. Annoying! The final touch: on top of the device is a super tiny IR blaster for controlling your TV. You'd never even notice it if you weren't looking for it, and you won't look for it. As we noted in our original hands-on, the S4 comes packed full of "features." There's Air View, which allows you to hover your finger over the screen to see some information without actually clicking. There's Air Gestures, which allows you to wave your hand over the phone to change between tabs or photos. There's Smart Scroll, with which you tilt your device to scroll, instead of using your finger. There's Smart Pause, which will pause a video when you look away from the screen. And there's Group Play, which lets you play a handful of selected video games with friends on the same Wi-Fi network, or use several S4 phones as Sonos-like speakers. The most important thing you need to know about these features is that you will never use any of them. Ever. Never ever. The end. Why not? Oh, lots of reasons. Air View only works with Samsung's customized apps—not Gmail, not Chrome—and even then it doesn't work very well. Air Gestures are less accurate and less convenient than just touching the screen. Smart Scroll is totally unreliable, and Smart Pause is totally useless. The only, only justification for any of these features is that you can wave your hand over the phone to answer a call while driving, or, again, maybe if you're addicted to buffalo wings and have an aversion to moist towelettes. Make no mistake. These "features" are nothing more than gimmicks, case studies in why different doesn't always mean better, and can often be worse. The good news is that you can turn off and/or totally ignore most of these extraneous "features," and when you do, there's a very good phone underneath. It's generally very fast, and HD games like Temple Run: Oz, Inertia HD, and Naught all ran smoothly. The pre-installed sliding keyboard is better than most manufacturer keyboards (looking at you, HTC), with plenty of space between keys and a dedicated number row, but auto-correct has a lot of issues, and we still prefer the keyboard on stock Jelly Bean or SwiftKey 4. The unit we tested was on T-Mobile's HSPA+ 42 network (no T-Mobile LTE in NYC, yet, though this phone will work with it when it rolls out); data speeds were good, and it connected reliably. There will be a cadre of S4 accessories available (TV adapters and such) at some point, but the only one available at launch is the S View Flip Cover. It's a good-looking cover that adds almost no thickness to your phone by completely replacing the back. The phone can sense when the cover is closed, and it will only light up one little (plastic) window on the front, which should save you a little battery power (when an AMOLED pixel is black it doesn't use any power). You can swipe to accept or dismiss calls even when the cover is closed. All of which sounds handy, but it makes the phone more cumbersome to use. It means you have to use two hands when you first pull your phone out, and when it's folded back, there's an extra piece of plastic your camera has to shoot through. It also makes the volume rocker way harder to access. In general, not worth it. Especially for the $60 price tag. In decent lighting, the camera is among the best shooters out there. Images are very sharp and there's a surprising amount of depth of field. Colors are rich, though they border on over-saturation, and video quality is excellent. You can check out plenty of our sample shots here. The camera app's mode selection wheel, which was lifted from Samsung's own Galaxy Camera, is the most intuitive method for switching between shooting modes on any smartphone we've tested. It has photos showing you exactly what you're getting, underneath clear text, which eliminates any guesswork. Battery performance on the S4 is among the best we've seen from smartphones this year, though it's still not anywhere near as everlasting as the RAZR MAXX HD. It's important to note, though, that our testing took place on T-Mobile's HSPA+ network, and not the more power-hungry LTE of Verizon and AT&T (Update: See below for test notes with LTE). With that advantage, it slightly edged out the HTC One by an hour or so on average (which itself does pretty decently). The S4 did, though, make it to the end of the night without additional charging fairly often, thanks to both the larger battery (2600mAh vs. 2300mAh on the One) and the more economical AMOLED screen, though the processor's higher clock speed taxed it somewhat. Speaking of which: that screen really is leaps and bounds better than the one on last year's S III. It's very sharp, pretty, and easy to read. The camera app is laid out very nicely, and the included OCR (optical character recognition) software, which can translate written words on the fly, are both examples of app actually done right. Overall, the S4 is definitely a sizable upgrade over the S III. But it's still got its issues. Big surprise to nobody: the software is not up to snuff. Let's ignore for a moment that all of the "innovative" banner "features" mentioned above are at best useless and at worst annoying. The rest of the UI ain't much better. For example, there's a "feature" that gives you access to a little drawer of favorite apps on the left side of your screen, called the "Multi window." Just tap the little tab, and the drawer slides up. The problem? That tab does not go away. Even when you're watching a video. Worse, you'll accidentally click it when scrolling through your email or web pages. You can disable it entirely, but isn't there a way to have it be there and be a hinderance to your productivity? [UPDATE: Allow me to admit my wrongness. As commenters have pointed out, the Multi window can be disabled or enabled by holding down the Back button. This is not intuitive, per se, but once you know that's how it works, it's certainly easy enough to do.] Or there's the Watch ON app, which is a combination of a program guide and a universal remote. Aside from the fact that it's hard to navigate, it gets your TV's inputs all mixed up, despite the fact that I was testing it with a Samsung TV. Or it let me control my Roku player, but it forgot to include a home button, so you can't switch out of HBO Go and into another application. The phone is full of little face-palm moments like this. But the software's worst offense? It makes the phone slow. Well, not slow, exactly, but much slower than it should be. The Galaxy S4 has a 1.9GHz Snapdragon 600 processor. The HTC One has the exact same processor, but it's only clocked to 1.7GHz. So the S4 should be faster, right? Wrong. Despite that fact that the S4 benchmarks better, the HTC One leaves the S4 in the dust in every practical way possible. 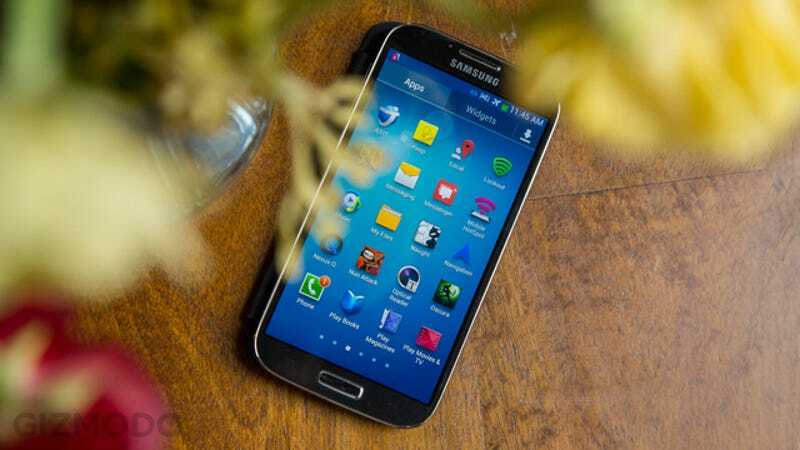 The One boots up three times faster, navigates the UI quicker, scrolls smoother, opens apps speedier, and most importantly, takes photos with no shutter lag, whereas the Galaxy S4 generally takes about a second to fire off a shot. Can you solve that by rooting your Galaxy S4? Probably. But we're reviewing the phone as it will be sold to you. And that phone has no excuse for being this laggy. Sound on the S4 is another problem. It still has just one tiny, tin-can-sounding speaker on the bottom back of the phone. It's quiet enough that I often missed a call or text even when I was just one room away. This problem is exacerbated if you put the phone down screen up (as one usually does), especially on something soft like a couch. Here, again, the HTC One blows the S4 out of the water, with its dual, stereo, front-facing speakers which are both very clear and loud enough to give you a heart attack in the morning if you set your alarm too loud. And while the camera on the S4 edges out the HTC One in bright daylight, the HTC One absolutely stomps the the S4 in low-light. Spot much of a difference in the photo above? The phrase "it's like night and day" has never been more apt. To be fair, you can manually flip it into Night Mode, which will have the same effect as cranking your ISO waaay up. In other words, you'll be able to see more, but it will be noisy as hell and lose a lot of detail in the fuzz, and it's just inconvenient to have to do that, anyway. In terms of design and build-quality, the One just feels like it's one or two tiers above the S4. There's simply an "Oooh!" factor that the S4 lacks, and all of Samsung's bells and whistles can't hide it. The S4 is a very good phone, but there are very few compelling reasons to buy it over the HTC One. Let's list them. 1. You're on Verizon. Unfortunately, Verizon is the only major carrier who won't be carrying the HTC One. If you're a subscriber, you can and probably should yell at them about that. UPDATE: Actually, Verizon just announced it will be carrying the One as well. 2. You absolutely must have expandable storage and/or a removable battery. 3. You really need that extra hour of battery life. The S4 is far from a bad phone. In fact, were it not for the HTC One, it would be the best Android phone you can buy. And one can't help but think that had Samsung poured all of its innovation into maximizing the practical user experience—instead of highly ignorable gimmicks—it might have taken the crown. UPDATE (6/3/13): We just spent the last week with Verizon's LTE version of the Galaxy S4, and we have good news. The LTE radio really doesn't seem to have impacted battery life at all. We still made it to the end of the night more often than not with medium-heavy usage. Data speeds (tested around New York City) are nice and fast. Average download speeds were roughly 15Mbps with peaks around 22Mbps. The slowest we ever got was 9.2Mbps, which is still extremely fast. The upload side was a bit of a surprise, though. The average upload speed was 2.2Mbps. That's slower than we're used to seeing from Verizon. Still, fast enough for everyday communications, it'll just be annoying if you're uploading a ton of HD video (which you probably want to be doing over Wi-Fi anyway). In general, we're still really enjoying using the S4 and we're still calling it our second-favorite Android phone. Whether you go with this or the HTC One, you'll be happy with your decision.